2013 GRAMMY ARRIVALS: Estelle "Plays It Safe" & Rocks Her Own Design On The Red Carpet! 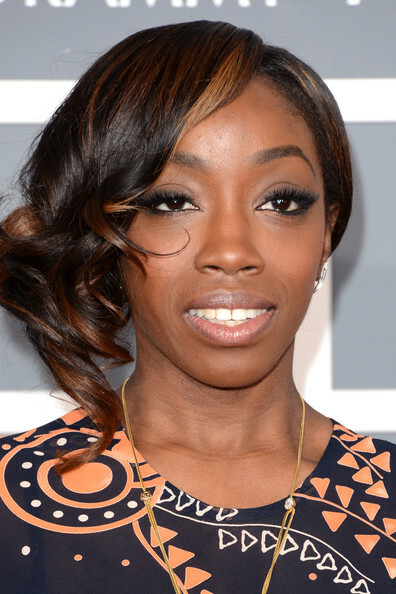 British singer Estelle was posing it up at the 55th Annual Grammy Awards Show at the Staples Center in Los Angeles. And the chick will be seated tonight as she played it safe, rocking an eye catching print she designed herself. She is most definitely a sending a tribute to her heritage. Um are these chicks even basketball wives? ?....Anyhow meet the two new basketball wives of L.A. stars/ video chicks Brooke Bailey And Bambi. Estelle Defends Chris Brown Over Rihanna Assault! The London-born / singer Estelle says she doesn't understand why the public and the media are still "crucifying" Chris three-years after the incident, when he is trying to move forward with his life. Estelle Talks About Love, Singing Through Pain & Meeting Kanye In Esquire Magazine! Estelle brings sophistication to the cover of London’s Evening Standard. But things weren’t always so glamorous for the British singer. Estelle talks about what it was like growing up with six siblings and one parent and how she transformed from a “skinny, black girl in the ghetto” to the stunning black woman she is today. Estelle - "Thank You" [New Music Video] + Happy 32nd Birthday Estelle! Singer Estelle just debuted her brand new video for her single "Thank You." Estelle shot her new Iren Sheffield-directed video in L.A. Her hot leading man is Sean John model Tracey Dukes. And "Thank You" is her latest single off her upcoming album All Of Me dropping February 28th.